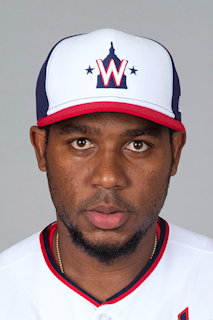 Maikel Antonio Franco (pronounced MY-kehl FRAHN-koh)…Attended Liceo Azua de Compostela, where he played basketball and baseball… Hobby: Spending time with family and friends… Signed by: Koby Pérez. Was the only player in MLB with 20 or more HR and 62 or fewer strikeouts...Led the club in AVG...Posted his third straight 20-homer season... Homered in 5 straight home games from 9/29/17-4/7/18... Collected at least 4 RBI in consecutive games, 4/5 & 4/7 vs MIA, for the second time in his career (also: 6/22-23/15 at NYY)...On 4/7 vs MIA, slugged a grand slam in the 1st inning (Dillon Peters), the fourth of his career (last: 4/26/17 vs MIA)...Tied his career high with 4 hits, 6/23 at WSH... Logged his third and fourth career multi-HR games: 7/23 vs LAD and 7/26 at CIN... His 7 HR in July were his most in a single calendar month since June 2015, when he slugged a career-high 8 HR... Slugged his first career walk-off HR on 8/2 vs MIA (3-run shot, 9th inn. off Kyle Barraclough); it was his second career walk-off hit (other: single, 4/22/17 vs ATL)...Played in his 500th career game, 8/3 vs MIA...From 7/10-end of the season, hit .317 (13-41), 2B, 4 HR, 19 RBI with RISP...In his last 68 games (6/23-end of season), batted .298 (67-225), 11 2B, 13 HR, 32 RBI, 15 BB, .342 OBP and .520 SLG %...Went 4-for-12 (.333), HR, 11 RBI, BB with the bases loaded. Established career highs in games (154), doubles (29), XBH (53), walks (41) and go-ahead RBI (24)... Had a team-high 12 HR that either tied the game or gave the Phillies a lead... T-3rd in the NL in grand slams (2)... Became the first Phillies 3rd baseman to hit 20 or more HR in consecutive seasons since 1997-2001 (Scott Rolen)... Homered in back-to-back games, 4/11-12 vs NYM... Slugged his 2nd & 3rd career grand slams: 4/12 vs NYM (Hansel Robles) and 4/26 vs MIA (Wei-Yin Chen)... Became the fi rst Phillie in franchise history with two grand slams before the end of April... Tied his career high with 4 hits twice: 6/13 at BOS and 7/14 at MIL... Led the club in HR and RBI. Led the team in RBI (88) & SLG % (.427) and tied for the team lead in HR (25) & XBH (49)...T-9th in the NL in game-winning RBI (13)...Made 147 starts, all at 3rd base...Was the first Phillies 3rd baseman to hit 25 HR in a season since 2001 (Scott Rolen, 25)...Had his 2nd career multi-HR game, 4/22 at MIL...Homered in 4 straight games, 7/3-6, becoming the first Phillie to do so since 2012 (Ryan Howard)...Batted .306 (30-98), 5 2B, 3 HR, 16 RBI in his final 26 games of the season...The Phillies went 16-8 (.667) when he homered. Was the Paul Owens Award winner as the best player in the Phillies minor league system...Led all of Minor League Baseball in total bases (308) while finishing T-2nd in XBH (70), 4th in hits, T-7th in HR (31) and T-8th in RBI (103)...Also led all Phillies minor leaguers in AVG (.320), HR and RBI...Began season with Clearwater (A)...Hit 2 HR with a professional-high 7 RBI, 4/26 vs Tampa...Selected as a Florida State League midseason All-Star...Named Phillies Minor League Player of the Month for June (.404 AVG, 3 2B, 10 HR, 26 RBI) and Phillies Minor League Player of the Week twice (5/13-19 & 6/17-23)...Selected to the World roster for MLB Futures Game at Citi Field...Promoted to Reading (AA) on 6/20...Had an 18-game hitting streak between both levels, 6/9-30 (.446, 33-74)...Played in 8 games at 1st base in August...Following the season, was named the top prospect in the Phillies minor league system by Baseball America...Played for Cibao of the Dominican Winter League (.226, 8 2B, 3 HR, 14 RBI, 47 G). 3rd in games (132), T-4th in RBI (84), 5th in hits (141) and 6th in total bases (221)...Had a season-high 5 RBI twice: 7/11 vs Hickory & 8/17 at Greensboro...Named Phillies Minor League Player of the Week, 8/27-9/5 (.556, 3 2B, 5 RBI)...Batted .207 (49-237) over 64 games in the 1st half of the season and .346 (92-266) over 68 games in the 2nd half...Following the season, was named the 8th-best prospect in the Phillies minor league system by Baseball America...Appeared in 1 game for Gigantes del Cibao in the Dominican Winter League. Crosscutters...Appeared in 17 games with Lakewood, 8/2-23..Following the season, was named 10th-best prospect in Phillies minor league system by Baseball America. Began his pro career with the Gulf Coast League Phillies (R)...Participated in Florida Instructional League. January 2, 2017 3B Maikel Franco assigned to Gigantes del Cibao. October 1, 2015 Philadelphia Phillies activated 3B Maikel Franco from the 15-day injured list. May 15, 2015 Philadelphia Phillies recalled 3B Maikel Franco from Lehigh Valley IronPigs. March 20, 2015 Philadelphia Phillies optioned 3B Maikel Franco to Lehigh Valley IronPigs. January 28, 2015 3B Maikel Franco assigned to Dominican Republic. September 2, 2014 Philadelphia Phillies selected the contract of Maikel Franco from Lehigh Valley IronPigs. March 30, 2014 3B Maikel Franco assigned to Lehigh Valley IronPigs from Reading Fightin Phils. January 8, 2014 Philadelphia Phillies invited non-roster 3B Maikel Franco to spring training. June 20, 2013 3B Maikel Franco assigned to Reading Fightin Phils from Clearwater Threshers. April 3, 2013 Maikel Franco assigned to Clearwater Threshers from Lakewood BlueClaws. October 13, 2012 3B Maikel Franco assigned to Gigantes del Cibao. March 31, 2012 Maikel Franco assigned to Lakewood BlueClaws from Williamsport Crosscutters. March 26, 2012 3B Maikel Franco assigned to Philadelphia Phillies. August 23, 2011 Maikel Franco assigned to Williamsport Crosscutters from Lakewood BlueClaws. August 2, 2011 Maikel Franco assigned to Lakewood BlueClaws from Williamsport Crosscutters. June 15, 2011 Maikel Franco assigned to Williamsport Crosscutters from GCL Phillies. June 21, 2010 Maikel Franco assigned to GCL Phillies from Philadelphia Phillies. June 20, 2010 Philadelphia Phillies signed 3B Maikel Franco.